My grandfather, Jesse Louis Dunn (shown above on his wedding day in 1908), has long been something of a challenge to the family historian. I will continue to research his life as my Dunn history progresses. For the moment, however, I am putting up some general background notes. These are outline notes showing Jesse Louis Dunn's whereabouts in each federal census and oterh information we have about his movements during his lifetime, including all the listings found in Springfield, MO city directories during a 1999 visit to the Springfield Public Library, deed information from the Christian County deedbooks, etc. 1867: Jesse Louis Dunn was almost certainly born on October 3, 1867, though in his later life he himself and others regularly listed his birthdate as the same day in 1868. His tombstone says 1868. However, his father, John Henry Dunn, in his own hand, listed his children in his Civil War pension application, and lists J.L. Dunn first, born October 3, 1867, followed by James G. Dunn, born March 1, 1869. This latter date is the same as the one preserved by living descendants of James Gazaway Dunn, the second son. If James was born in March of 1869, then J.L. cannot have been born in October of 1868 of the same mother, only five months apart. In the 1870 census, J.L. is listed as two and James G. as one; the census was taken in the early part of 1870. In addition to Rev. J.H. Dunn's own testimony on the date being 1867, when J.L. Dunn enlisted in the Army May 23, 1892, his age was given as 24 years and eight months, which would give October 1867. When discharged August 22, 1895, his age was given as 27½ would give a date in late 1867 or early 1868 depending on how precise one assumes that "one-half" to be. But by the 1900 census, J.L. Dunn was telling the censustaker that he was born in October 1868, and most later references to age indicate that he continued to use that as his birthdate. Whether he was unsure of the year of his birth or decided to shave a year off his age is not known, but I believe that 1867 must be the correct date because of James G. Dunn's birth in May of 1869, a date verified by all the sources I know of. 1870: Listed as age two in Gilmer County Georgia. His father was blacksmithing at the time, and was only admitted "on trial" to preach in 1872. They were either in the Ellijay or Cartecay areas of the county. 1880: Shown in the census with his parents and family in Walker County, Georgia. His father was preaching in Lafayette, Georgia from 1880-82. He must have moved around frequently with his father, who as a Methodist preacher was moving every two or three years. J.L. Dunn's younger brother Will is apparently the Willie Dunn who attended Ellijay seminary, which served as Ellijay's main school; J.L. may have as well, at least when the family was near Ellijay. The seminary was run by the Northern Methodists, and his father had helped start it. My Uncle John L. Dunn believed that his father had been sent away to school and then continued westward, and speculated that as the eldest son of a minister, he might have been intended for the ministry. His father's colleague, R.H. Robb, was closely connected with Tennessee Wesleyan College (now Tennessee Wesleyan University), a Northern Methodist institution; if J.L. Dunn was to study for the ministry he might have been sent there or somewhere else. A search of the records might be useful. Before we began to learn more in the 1960s, both my father and my Uncle John told me their father came from "around Rome, Georgia". Rome is not, in fact, very close to the places most associated with the Dunns, though it is in northwest Georgia. It is possible that J.L. Dunn spent some of his young adulthood in or around Rome, and that this was the reason the name of the town was remembered. I have never found any evidence that Rev. J.H. Dunn ever had a pulpit in Rome. 1892-1895: The Army. Jesse Louis Dunn enlisted in the United States Army on May 23, 1892. For years, knowing that he had been stationed in Fort Riley, Kansas in the Army, I assumed that he first came to the Midwest in the Army. But in fact, he enlisted in Springfield, Missouri! How long he had been in Missouri or why and how he came there we do not know. I have found no record of him, at least so far, in Springfield or other nearby areas, prior to about 1907, but he was in Springfield in 1892 according to his enlistment records. He served in Light Battery F of the Second Regiment of Artillery, enlisting for five years but being honorably discharged after a bit more than three. This was the peacetime army, and of his tour was spent at Fort Riley, Kansas, but according to both family tradition and unit records his unit was sent to Chicago with the troops used to put down the Pullman Strike in July of 1894. 1895-? When J.L. Dunn was discharged, at Fort Riley in August of 1895, that is the last we hear of him for five years, until the 1900 US Census. If he was in southwest Missouri, he didn't leave many traces. His earliest purchase of land in Christian County, MO is not until 1907; while I have not searched all the Springfield records those I have have shown no indications of his presence. As the next entry shows, he may have been just about anywhere. 1900 Census: In the US Census of 1900, J.L. Dunn, 31, born October 1868(!) in Georgia, father born in Tennessee and mother born in Georgia (thus undoubtedly our J.L. Dunn) is listed in Mokane, Calloway County, Missouri, in the Missouri River Valley east of Jefferson City, an area of the state I don't think any of the family ever knew he had been to. He was renting a house there, his employment is listed as "Salesman Hardware", a pursuit he would follow elsewhere later, and it is noted that during the previous year he had been unemployed for one month. I have so far found no other records linking him with this area. 1900-1907? After the 1900 census, the next formal, verifiable records I have found begin with his purchase of land in and around Clever, Missouri in 1907. But there is some oral tradition about his wherabouts during the intervening years. My father and uncle remembered that he had lived at some time near Boaz, a tiny community southeast of Clever; my father also remembered that he had worked in a photography shop. An old-timer in Clever wrote me in the 1960s that J.L. Dunn had "done photography" at Jumbo Mill, south of Boaz (it was located right on the Christian/Stone County line), and also worked for a Mr. Plank at Boaz. This apparently was prior to 1907 when he begins to leave traces in Clever. I do not know how long a period may be embraced by the jobs in and around Boaz, however. The 1912 Christian County plat book shows no Mr. Plank living (or at any rate owning property) near Boaz, though there are Planks elsewhere in the county. 1907: With 1907 we begin to get a much more detailed account of J.L. Dunn, and from then on can follow him with few gaps. He is said to have become a notary public in Clever in that year. On December 10, 1907, he bought Lots 7 and 8 in Block 2 in the town of Clever. These would have been a block west of the main street. 1908: Effie Lorena Collins was teaching school "three miles north of Clever", apparently referring to the school known as Sharon Hill or Tarrapin Hill (so spelled in the Christian County school records), on Terrell's creek north of Clever. It is no longer standing. Near the school much of the land was owned by a Cheatham, and an old-timer in Clever told me that "before he was married your grandfather worked for a Dr. Cheatham", so perhaps this connection has something to do with their meeting. J.L. 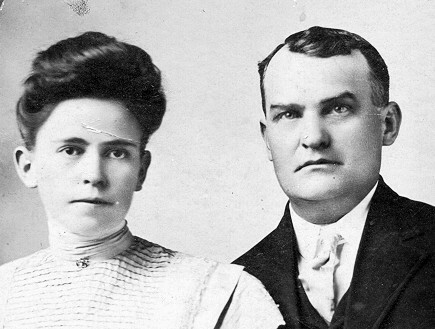 Dunn and Effie L. Collins married on May 2, 1908. He was 40 (if born in 1867), and she was 28. Both were rather old for a first marriage at the time. Perhaps because of his marriage, J.L. Dunn seems to have made a number of land transactions that year. On July 23, 1908, he sold the two lots he had acquired the previous year. On December 29, 1908, he bought property on the north end of Clever. I think this must be the property on which stood a home said to have been built by J.L. Dunn which a 1968 correspondent called "one of the prettiest in town", later owned by C.L. Brown. No house in that area today is old enough or pretty enough to fit the description, so I suspect it has been torn down since 1968. Over the next few years, J.L. Dunn acquired land outside of Clever and also engaged in business in the town. I am not listing all the land transactions here as at least some of them must have been speculative, such as, for example, lots one through six in Block six of Clever, which he bought in September 1911 but sold to C.L. Brown in February of 1912, only some five months later. He continued to acquire land both in and outside of Clever through 1911; he seems to have sold much of it in 1911 and 1912. Both John and Howard Dunn, the latter born May 1911, were born in Clever. The 1912 plat book Atlas of Christian County shows J.L. Dunn holding land southeast of Clever, but the land shown was apparently actually sold in 1911, according to the deed books. I have copies of the platbook pages and of a plat of the town lots of Clever, and will in time produce maps showing each of these purchases and sales. 1910 Census: "Jesy L Dunn" is shown as living in "Clever Village" on "Market Street", age 41 "Clerk, Hardware", with family. No Market Street is labeled as such in the 1912 plat of Clever, but I think it is a major unlabeled street on the north end of town, where J.L. Dunn had his house. 1912: That platbook/atlas also includes a small advertisement for "Dunn, J.L., General Hardware & Implements. Both Shelf & Heavy, together with harness & sadlery. Clever." 1915?-1920: The first residence in the Chadwick area of Christian County followed the Arkansas stay. The earliest deed I have found dates from 1917, and there are several transactions in 1917 and 1918. A photo from John L. Dunn (copy given to me by Jack Dunn and/or Kathryn Neely) shows an "old Dunn house" from Chadwick where he is said to have lived about 1915. Although the house in the photo (probably 1960s or 1970s photo?) is no longer standing, the barn is, and it can be identified as a property that J.L. Dunn leased in 1917 for a three year term to 1920. He also owned property in downtown Chadwick near the railway terminal (apparently his place of business as a produce dealer and meat shipper) and, at one point, north of town in the direction of Oldfield. 1920 census: Was still in Chadwick for the US census, which lists Jesse L. Dunn on E. Flora Avenue in Chadwick (this is the address in town, near the railroad). "Dealer in Produce, Chadwick Produce Co.", age 51; wife Effie L., 40, sons John L., 11, and Howard C, eight, both in school. 1920-21: The first move to Springfield. According to a 1920-21 Springfield City Directory (Dunham's), he was residing at 1453 Winkle, working in sales for McGregor-Noe Hardware Co.There is no Winkle Street in Springfield today but the old directories say that Winkle was the first street north of Grand Ave running from from Fremont east to Delaware Ave.
1921: My father had remembered that after the first move to Springfield, his mother gave birth to a baby girl who lived only a brief time. The abstracted records of the Alma Lohmeyer Funeral Home show that an "Infant of Jesse L. & Effie Dunn, 1501 Lombard Street, b. 10 Sept and d. 12 Sept. 1921" was interned in Highlandville Cemetery. It is worth noting that while the 1920-21 city directory gave the address on Winkle Street, this gives an address on Lombard Street. c. 1922-1924? J.L. Dunn returned to Chadwick in the early 1920s and lived there for a few more years; my Dad indicated that the moving back and forth caused him to have to graduate late because Chadwick did not offer the same school years as Springfield. The return to Chadwick does not seem to be documented in the deed books, so he may have rented property there. 1925: Dunham's Directory; 1043 N Grant; "sales". 1927: Polk's, residence 737 N Jefferson, Jessie L., "slsmn J.C. Dysart Mule Co."; Effie L. "waitress Davidson cafeteria". J.C. Dysart Mule Co. was located at 325 W. Olive. 1928: Polk's Directory, Jessie L and Effie at 865 N Jefferson, Jessie L. is "Office Mgr JC Dysart Mule Co."; Effie "waitress Davidson's Cafeteria", Howard "student", John "clk Jos W. Stevens". 1929: Polk's. Family at 934 N Robertson. Family head is mistakenly listed as "John L." Dunn with wife Effie. Father is "slsmn", place not given. Effie is "hlpr" (helper) at Davidson's Cafeteria, John L. "Jr." (so listed) is "clk" (clerk), and Howard C. is "student"
1930: Polk's Directory. Residence of Jesse L. & family is 1354 Frisco Ave. (first mention of the Frisco Ave. address). Jesse L. is "office mgr MCP Oil Co"; Effie is "with Davidson's Cafeteria", John L is "driver Conways Quality Grocery & Market", and Howard C is "with Davidson's Cafeteria". 1931: Polk's Directory. 701 ½ North Jefferson. (Notice this is the third address on N Jefferson.) Listing is under J. Louis Dunn. The 1354 Frisco Ave. address is now listed under John L. and Inez A. Dunn, with Louis, Effie and Howard listed under the North Jefferson address. J. Louis Dunn listed as "lab" (laborer); Effie as "salads Davidson's Cafeteria", Howard as "steam table Davidson's Cafeteria". (In this year, Davidson's was located at 412-14 St. Louis.) In separate listing, John L. and Inez A are listed at 1354 Frisco Ave., John as "Driver Conway's Quality Gro Mkt". 25 January 1932: Date of death. 1932: Polk's Directory. Listing is under "Effie Mrs", so directory was published after J.L. Dunn's death on 25 January 1932. Family are now listed at "1359 Frisco Ave." though this is obviously a mistake for 1354. John L is still with Conways and Howard is a clerk with ---- Drug (cannot read my own notes).